In order for your company's operations to run smoothly, you need reliable lift trucks and warehousing solutions to keep your goods moving. 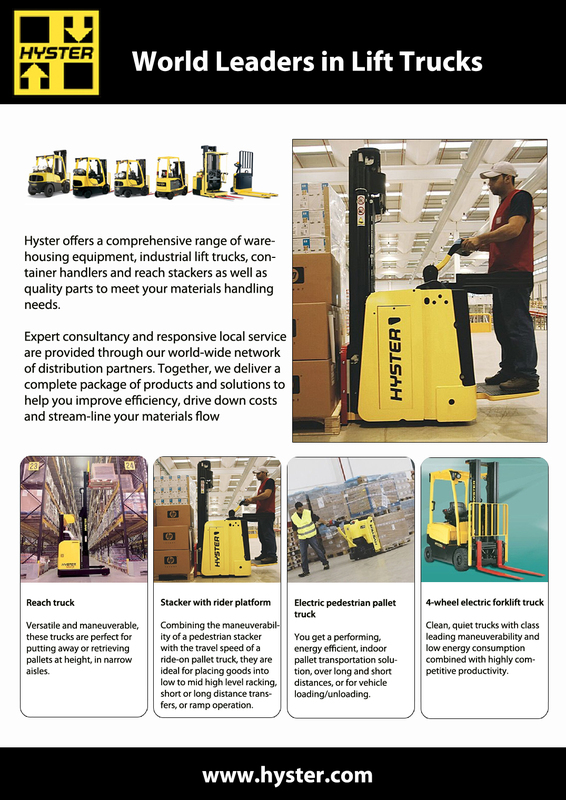 From the smallest pallet trucks through heavy capacity forklifts to container handlers, the comprehensive range of Hyster® equipment is designed for dependability. We are committed to being the most trusted partner of quality lift trucks and warehousing solutions in the global marketplace. A worldwide organization associated with the strength of one of the largest distribution networks, Hyster takes a global approach to product design, manufacturing, and supply-chain, but allows each region to tailor products and solutions to local needs. Select your country or region to learn about the full range of Hyster products and tailored solutions available to meet your needs.